Is this a temporary offer, or part of a drive to eventually clear inventory? Probably the latter, I'd imagine that sales of the IDOL 4 Pro might only continue until the summer of 2018. But while £420 was on the high side for the specs in 2018, I think that £320 is quite good value, especially considering that it's still the highest specced Windows 10 Mobile smartphone, arguably. 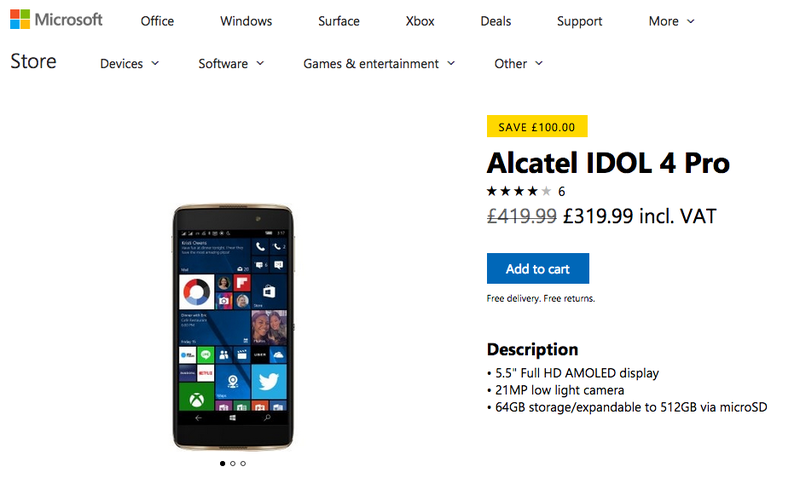 You can find the IDOL 4 Pro at that price here on Microsoft's UK web site. It's also on offer (100 Euros off) on Microsoft France here and on Microsoft Germany here. And probably other Microsoft European sites, so check yours if you're interested. PS. See also my original review verdict on this smartphone here.